Hey gang, hope you had a great labor day weekend filled with food, fun, the beach maybe and of course baseball. College football is now in session but don’t tell UM that. They’re wishing that LSU game didn’t count. Hurricane woes aside, in this episode I’ll go over the latest slate of games, bring the spotlight on our latest rookie and predict whether or not we avoid the dreaded 100 losses. And away we go! The revenge series began with the Braves coming to town during “Players’ Weekend” for a 4-game set, a little over a week since the fateful plunking of Ronald Acuña Jr. by Miami’s own José Ureña. Elieser Hernandez squared off against Sean Newcomb and this quickly became a one-sided affair. Newcomb mastered the Marlins, holding them to just two hits through six innings of work, striking out eight. Hernandez lasted three innings. He surrendered three runs, two of them being longballs including one from Acuña Jr. The bullpen stepped in but the offense did little to dig themselves out of the early 3-0 hole. The Braves tacked on two more en route to a 5-0 shutout for the opener. Despite the victory, this was anything but a stroll in the park for the Georgian rivals. As the second game approached, storm clouds gathered inside the stadium. These proverbial dark clouds were followed by “Thunder” striking from the mound. Dan Straily donned the nickname with pride, his fast as lightning pitches bullying hitters back to the bench. Through six frames, the Braves cowered in their dugout waiting for the storm to pass. Once “Los Tres Caballeros” (Tayron Guerrero, Drew Steckenrider, Adam Conley) took over, they didn’t give an inch keeping Atlanta hitless. Thanks to Derek “Dietz”Dietrich’s RBI-single in the fourth, Miami outlasted their opponents 1-0. The seven game losing streak against the Braves ended. The good times kept on rolling as Wei-Yin Chen was up next. “Weigh In” definitely threw his weight around, putting on a heavy-weight performance. Chen lasted six innings but absolutely dominated, shutting out the NL-East visitors. He held them to six hits, striking out 10. At the plate, the “Real” J.T. Realmuto got Miami on the board in the home half of the sixth with a sac-fly RBI. Brian “Andy” Anderson followed up with a pinch-hit laser to leftfield going infinity and beyond, putting the Marlins up 3-0. Woody would be proud. Steckenrider gave up a run in the ninth but held firm for the win. And then came the fourth game. And the wall. Miami’s bats went silent, producing a pair of hits with nothing to show for. The Braves’ Kevin “Gausy” Gausman lasted five innings, fanning just as many batters. The pen kept up the stellar work. Pablo “Pache” López had a great outing actually, he lasted nearly six innings and only gave up a run. But this was more than enough as Atlanta went on to win 4-0 to split the series. From there, the Fighting Fish traveled to the fabled Fenway Park to face off against the Boston Red Soxs. Despite a heartbreaking loss, the first game was quite the thriller. Ureña squared off against Brian Johnson. Boston struck first in their half of the second with Miami tying it the following inning. Isaac Galloway was completely unphased by the green monster, launching one right over the wall for his second homer of the season. However, the Marlins quickly fell behind again giving up two more runs. Fast forwarding to the eighth inning, Miami broke out with five runs including back-to-back dingers from JT Realmuto and Starlin Castro. Unfortunately for the boys from the south, Boston struck back with three runs of their own to wrestle the lead back before a heroic effort by Magneuris Sierra to tie it again with an RBI-single. The Red Soxs achieved an exciting walk-off when JT Riddle tagged second and one hopped it to first. Miguel Rojas was unable to scoop up the throw as it bounced past him, into the camera well. At least Ureña pitched a decent game. He went six deep and allowed four runs. Guerrero was given the blown save (He gave up three of his own) and Steckenrider was charged with the loss. Game 2 was worse. Oh yeah. So, the Marlins were up 5-3 heading into the seventh inning stretch, looking good for a series split. 15 batters, 11 runs and an embarrassed bullpen later the game turned into a crazy 14-6 rout. Conley, Steckenrider and Javy Guerra coughed up three runs EACH in this nightmare scenario, ruining a fairly efficient start from Trevor Richards (5.2 IP, 3 Hits, 3 Earned Runs, 6 Ks). All right, now for some overtime. The next opponent was the Toronto Blue Jays. Why am I going the extra mile for Ronto? Easy! Besides their rad uniforms, they were kind of, sort of my team before 1995. The 1992 World Series victory against the Braves helped a lot. Granted, I was a little kid but I still vaguely remember it. The first game’s ending was cringe-worthy. The Marlins were up 5-1 with Kyle Barraclough coming in to seal the deal. Cue the bullpen’s next implosion. “Bear Claw” gave up two hits and a walk to load the bases, his evening was done. With one out, Steckenrider took over, convincingly striking out Aledmys Diaz before walking Devon Travis to make it 5-2. The Jays sent out pinch-hitter Justin Smoak and then it happened, again might I add, another grand slam. De Ja Vu anyone? It wasn’t a walk off but it was enough to ruin a fantastic stint by Dan Straily (8 IP, 4 H, 1 ER). The final score: 6-5, Toronto. Game two saw another Marlin go 8-deep as Chen tossed an incredible game, holding the birds to a single run. Meanwhile, Miami exploded with four in the fifth, thanks mostly to a bases-clearing double by Martin Prado. Smoak homered again in the ninth but it wasn’t enough, the Fighting Fish took it 6-3. Jeff Brigham made his MLB debut toeing the rubber against fellow newcomer Sean Reid-Foley, who was also looking for his first career victory, he debuted back in Mid-August. One would taste their first win. The Washington native probably had a bad case of the jitters due to his rocky start, lasting three innings giving up three runs on four hits, four walks and a HBP. In other words, he had trouble with his command. The offense could only dole out one run as the bluebirds ran away with the series, 6-1. Reid-Foley for his part had a terrific outing keeping the Fish under control while fanning eight in his seven-inning tenure. It’s a different type of morning for Jeff. Brigham got the nod Saturday from Triple-A New Orleans as part of coach Don Mattingly’s strategy of experimenting with the September call-ups. When it comes to those still in the hunt, like the Philadelphia Phillies (The only one that fits the bill on the remaining schedule) he said that he will put out his best line-up card, hence why he pushed back Ureña’s start a day. It provides an excellent opportunity to conduct a sort of spring training, except in September. Brigham had a good minor league season with the Jumbo Shrimp (4-1 1.18 ERA) and the Baby Cakes (5-2 3.44 ERA), nabbing himself Pitcher of the Week back in April for Jacksonville. His performance warranted a pass to the Big Show. It’s less than ideal but this is what September’s all about for teams like the Marlins. From the beginning, this season was going to be about the rookies, the future. Like all prospects, they can shine or be a total bust but as always, time will tell for our newest hurler. I’m hoping he gets 2-3 more starts, so we can get a better glimpse of his abilities. He was selected in the fourth round of the 2014 draft by the LA Dodgers before eventually coming to South Florida. He can be a set piece for us down the road given our woes at the starting rotation, or maybe not. I’m hoping it’s the former since we could always use another good arm, we need one. In 95.1 IP, he had 94 strikeouts with opponents batting an anemic .238 this year in the minors. During that span, he’s only issued 22 walks. Speaking of September, besides our future, one other question of varied importance remains. 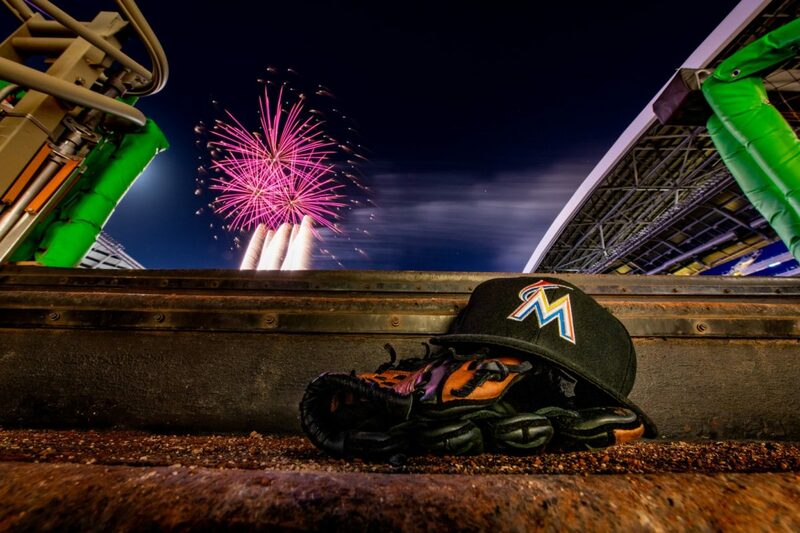 At 55-83 (Adding the Labor Day game), the Marlins have 24 games left on the schedule. It includes our NL-East rivals sans Atlanta along with the Pirates and Reds. As you’ve might have surmised, we lose 17 more and its pretty much a 100-loss season. While I have trouble foreseeing the team going 7-17 a little bit, it could happen. Given the large slate of teams already out of the running, don’t be surprised if Miami squeezes out one more run of good baseball. Not that it really matters at this point. Until next time, stay frosty folks. Just before the end of August, Christian Yelich played the best game of his life going 6-for-6 and hitting for the CYCLE. He became the eighth Milwaukee Brewers player to achieve the feat and tied the club record with six hits. Simply amazing. Keep up the epic work Yelich, Miami misses you man. Time to give credit where its due. Nationals pitcher Max Scherzer becomes the second player in MLB history to have five consecutive seasons with more than 250+ strikeouts. Who was the first? The BIG UNIT Randy Johnson from 1997-2002.